Some travelers stop in Fairbanks as the northernmost point in their Alaskan adventure. But for those willing to drive a little further, wonders definitely await. 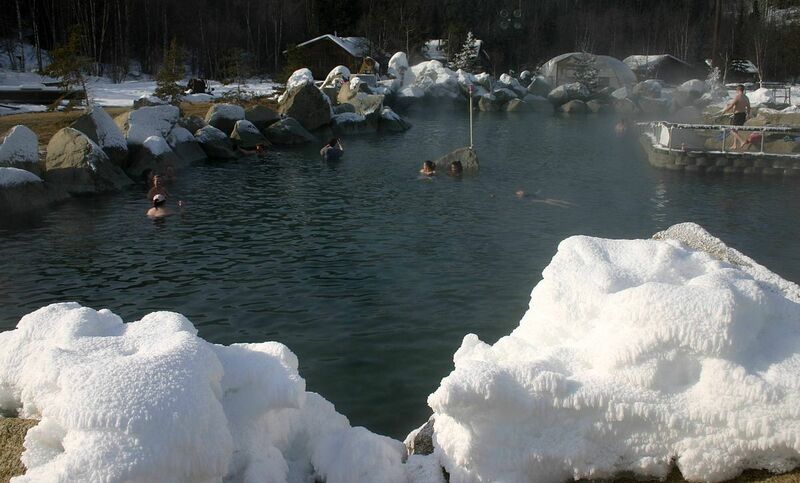 Chena Hot Springs is an all-season experience that is well worth the extra time. Gold prospectors at the turn of the 20th century discovered that the Chena Hot Springs were a great relief to their aching muscles. By 1912, it had become one of the premier resorts of interior Alaska. Visitors had to endure a multi-day stage coach ride from Fairbanks back then, but you can expect to get there in less than a 2-hour drive. But you’ll want to factor in more time for stops and wildlife viewing. Wildlife viewing spots are common throughout the entire road. Your best chance to see moose are in water holes of Chena River, including at Slough Lake (mile 28) and Red Squirrel Campground (mile 42). Fishermen can try their luck on the Chena River for arctic grayling (catch and release only) or at one of three stocked gravel ponds along the route (mileposts 30, 45, and 47). Other animals that might be seen are black and grizzly bears, fox, lynx, coyotes, and many birds including eagles and ravens. The real treasure is to be found at the end of the road – Chena Hot Springs Resort. The springs are at the center of a 40-square-mile geothermal area that produces a steady stream of water that, at 165 degrees, must be cooled to a safe temperature for soaking. The resort has several indoor and outdoor tubs, Jacuzzis, an indoor family swimming pool and outdoor boulder-ringed pool that provides a wonderful and relaxing vantage point for watching northern lights in winter. As an active geothermal center, the resort also utilizes this renewable energy source to run and to grow produce. You can sample their locally grown vegetables at the resort café and take one of the daily tours of the geothermal operations. Chena Hot Springs Resort also has the only year-round ice museum on the premises. It was created using 1,000 tons of locally harvested snow and ice and is kept cold in the summer using a patented absorption chiller. This resort is a must-see experience when you travel to the Fairbanks area. You are going to see and do things that are not available anywhere else in the world. ABC Motorhome can help you get there and have the time of your life.